More OPI today. So I have a confession - I'm totally hitting a wall when it comes to coming up with new nail art. Lately I've been obsessed with quilting block patterns. In fact, I have a secret pinterest board where I've been pinning quilts. 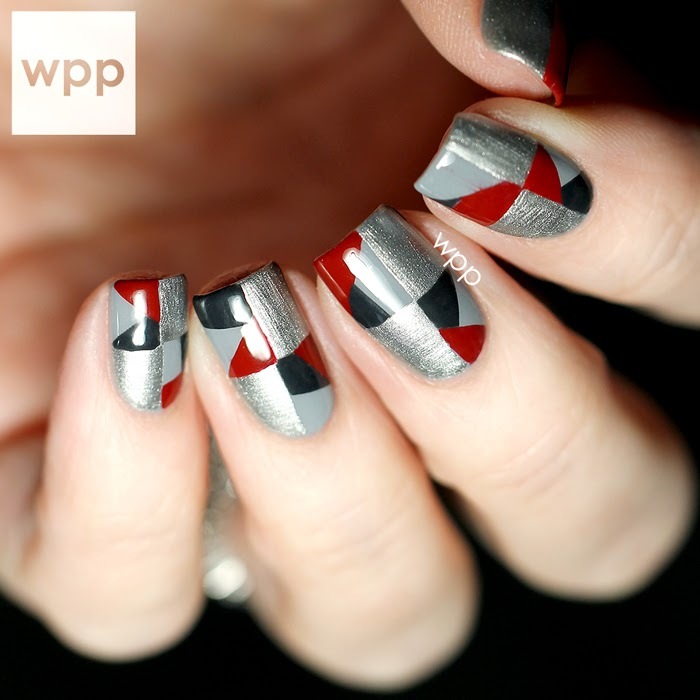 I decided to use the OPI 50 Shades of Grey Collection to put one to use. This design is based off a simple quilt block pattern and incorporates four of the six shades in the collection. You can tell more in person, but I purposely brushed on Shine for Me, the silver metallic, in different directions. It's subtle, but a cool detail, I think. The hard part was taping off the lines and keeping everything crisp. I cheated a little and freehanded in some places. I love this red, Romantically Involved. 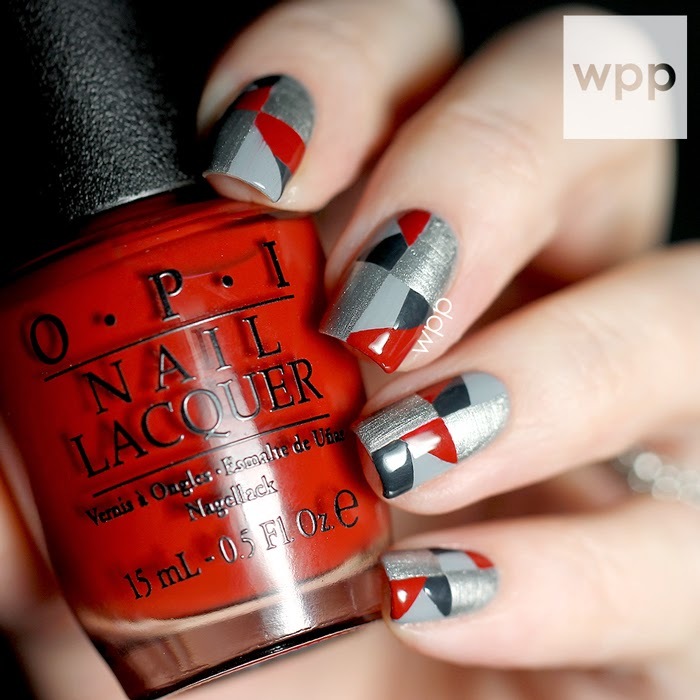 I know we've seen a gazillion reds from OPI lately, especially over the holidays...but you can't ever have enough! The other colors I used were Cement the Deal and Dark Side of the Mood. Here are the six shades in the 50 Shades of Grey Collection. I love gray polish, so I think it's a great set! The OPI 50 Shades of Grey Collection is available now at Professional Salons, including Beauty Brands, beautybrands.com, Chatters, Dillard’s, Regis, ULTA and ulta.com for $9.50 ($11.50 CAN) suggested retail for each nail lacquer. For more information, visit www.opi.com and follow OPI on Twitter and Instagram and Facebook. HOW: Easy peasy! Simply comment on this post! (Only the first comment will be counted as an entry.) Want more chances to win? Comment on these other posts (here, here, and here too) before the giveaway closes.